January 2018 JAX got a new scooter and this is him learning how to ride it his first couple of days! RideOn little buddy! Jax has good flow on the scooter. Good to see his interests are wide and make his reactions faster his mind sharper. Good stuff ! Thats very touching to me brother! He was just a little tiny boy when you first saw him and now he is getting bigger and bigger! This was last January so he is now even taller and stronger! Thank you! Jax is going to progress fast on that scooter. Nice airs at the skate park.! Nice pocket sized dogs hahahahaha Ride on! ahahahaha They each fit in one had, so I carry them together as they lick my face! We need some skate parks here as Jax wants to shred and practice more and more. Also his scooter skills will develop into bikes skills! Bro, that was great! I bet he had so much fun on the new scooter! RideOn Jax! Thank you very much! Man Im missing cali about now! hahahahaha Jax loves his scooter and rides it all the time, we next have to do an edit here in japan! Thank you Uncle L! rideOn!!!! Jax and I just got home from a fun ride. He is now on a 26in and it looks like it suits him! I really miss when he was 3-5, those were some fun times! Thank you very much! WOW really? Thank you! We have to take care of our little dudes! 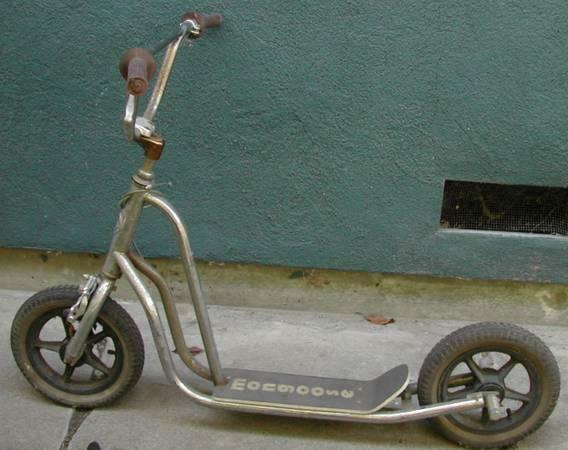 Yes, I too want one of the vintage scooters from the 80s, did you have one? I sure did and love it! Here is a vintage mongoose that they should still make now! So how about a scooter like that but with Fat tires? @nikoniko: A fat tire scooter, maybe 20” fatty wheels on 135mm hubs... I could probably build that. It sounds like wicked fun! I had a similar scooter, it was second hand from my sisters, haha. Super cool. My niece loves her scooter, its the best seeing little bro’s loving all things two wheeled! Ohhhh yes! Fat tire scooters, I hear a new thing coming! Most of my trials here are steep so we don't really pedal going down so, a scooter would be killer fun to try on a trail! @nikoniko: Oh yes, build one with a little clearance, disc brakes, scooter downhilling!! Nice Riding Skill!! Jax is growing up. Please show this video to all the girls!